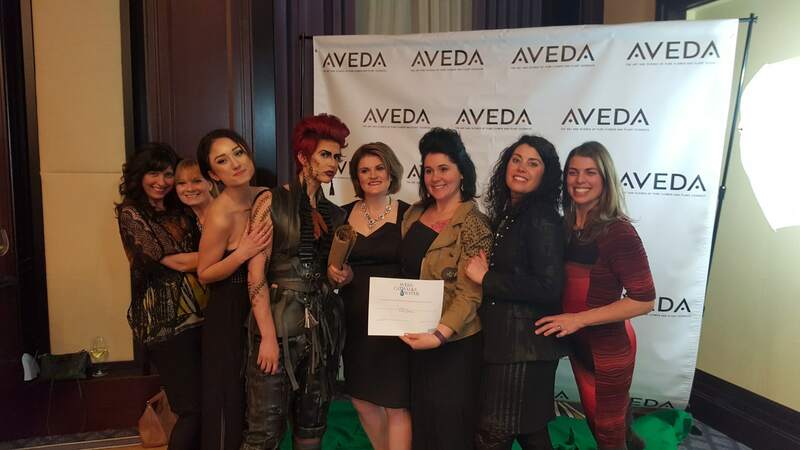 Having won “Best Overall” in the 2015 “Catwalk for Clean Water,” Debony Salon faced tough competition and critique from judges. Presenting their concept of “The Messenger,” which was inspired by Boston’s rich history of cycling as an alternative form of transportation and its ability to unite all people in the fight for a cleaner planet; Debony Salon won “Best Overall” for the second year in a row. 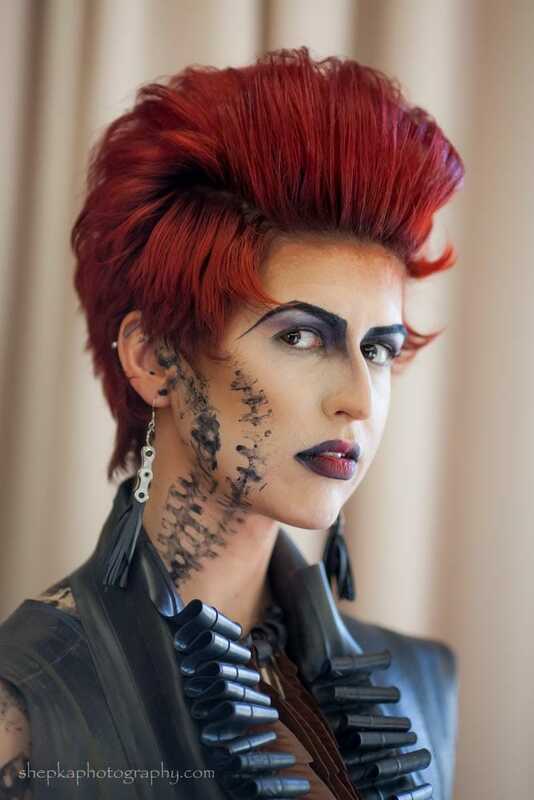 The salon was judged on its ability to create a costume from all recyclable materials and create a character using AVEDA hair color and make-up. Over the span of four months, “The Messenger” came to life. 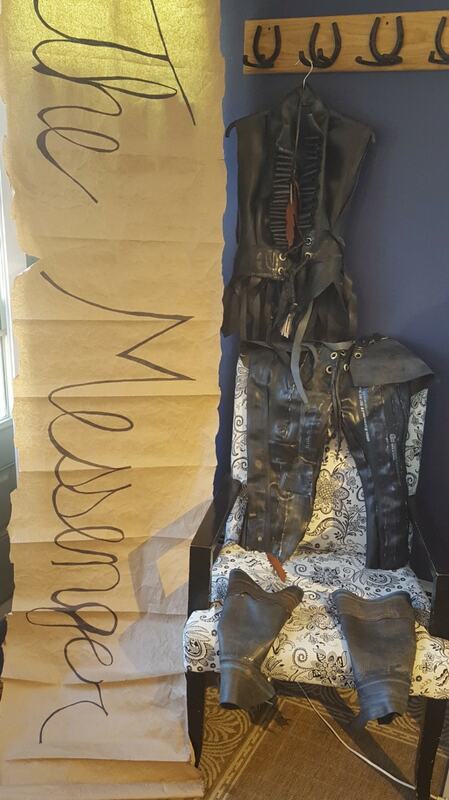 The costume was created by using inner tubes from bicycle and truck tires and was hand-made and stitched by Cassie Capone and Debony Diehl, with input from Andy Emery, Marissa Schoen and Sara Goulet of the salon. Local bike shop, Stan and Dan Sports, local community members and Frechette Tire donated materials to the concept and the staff of the salon challenged themselves with turning their model into a courier of alternative transportation and respect for our planet. Stylist, Tarmey Ross, completely transformed Jaimie’s hair into a short, pixie cut and turned her into a red head. “I loved that the hair color was the star of the style. Instead of doing a long hairdressing, which is common, we cut the hair short and let the vibrant pigment of the red do all the talking. The cut was a gorgeous mix of steampunk and pixie, with weight at the top and framing around the face and hairline,” Tarmey Ross. To create the vibrant red for the hair, Tarmey used, AVEDA’s Full Spectrum Deep Dark Red Base for the root and AVEDA Full Spectrum Pure Red for the ends. She styled it using AVEDA, Control Paste, Control Force hair spray and Thickening Tonic. Sarah Jette took the lead on make-up creating an androgynous and angular face using AVEDA “Moscara,” Mineral Tinted Moisturizer, two different tones of concealer; “Nutmeg” and “Amazonia,” “All-Spice” and “Blue Lapis” eye-liner and “Fire Maple” Lip Liner and “Nourish-mint” Lip Gloss. Proceeds of the “Catwalk for Clean Water” benefit the Clean Water Fund, which helps provide access to clean water in under-developed countries. Debony Salon is a full-service boutique salon and spa, located in Jackson, NH. 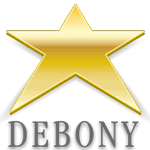 Offering wedding services, massage, facials, hair cut and color services, nail care and more, Debony Salon offers years of experience to help you feel and look your best. Like them on Facebook for promotions, events and sales or to book an appointment call 603-383-9366.